Tektites are natural glass objects primarily composed of silica. Tektites found on Earth are formed by large asteroidal or cometary impact with the Earth. Energy from the impact melts terrestrial rock and ejects it into the upper reaches of the atmosphere. A few minutes later tektites rain down. The final morphologies are largely dependent on the distance from the source crater and the degree of terrestrial weathering/etching. 1) A large comet or asteroid impacts the Earth where the bedrock is a silica-rich sediment or meta-sediment (this is why not all impacts produce tektites). 2) Terrestrial (Earth) rock is melted and ejected into the upper atmosphere at hyper-velocities. As it passes through the atmosphere the molten blob is flattened to varying degrees by atmospheric interaction (primarily dependent on height of formation, angle of ejection and velocity of the body). 3) Tektites are continually cooling whilst in space. Most will re-enter as cool bodies, some larger or more proximal tektites retain some heat. a) Tektites begin to re-enter the atmosphere. The first formed, most distally ejected, tektites enter at very high velocities. The ram pressure results in the body being heated and ablated. Closer to the source crater the tektites are formed later and re-enter at lower velocities as the energy is more dissipated. The anterior surface is heated, but insufficiently to melt the glass. b) Due to interaction with the atmosphere the tektites eventually lose their inherited velocity. The frigid air now rapidly cools the tektite. The rapid cooling causes spallation or brittle fracture. The anterior surface usually breaks away. c) The tektite lands, cool at distance, retaining some heat in larger specimens closer to the source crater. 4) In the soil tektites interact with water and are naturally etched, enlarging any paper-thin cracks. U-grooves form on the anterior and V-grooves may form on the posterior. Moldavites have often suffered extensive etching. Water transport may also result in a smoothing of the tektite. 5) Tektites are discovered by man and used as tools, in jewellery or collected scientifically. Prior to the Apollo lunar landings many scientists thought that tektites were derived from impact ejecta from the moon. It is now well established that tektites are terrestrial impact ejecta. The largest and most recent tektite strewn field is the Australasian Tektite Strewnfield. It covers around 20% of the Earth's surface. Tektites are found in geographically restricted areas or 'strewn fields' related to the source crater. The most recent and largest strewn field is in Australasia with tektites being found in the Indochinese peninsula (Thailand, Vietnam, Cambodia, Laos and southern parts of China), the Philippines, Malaysia, Indonesia and Australia. These tektites are derived from an unknown crater in the Indochinese Peninsula area. The second largest strewn field is in North America, with tektites being found in Georgia and Texas, derived from the Chesapeake Crater in North America. The green moldavite tektites are found principally in the Czech Republic from the Ries Crater in Germany. Tektites are also found in the Ivory Coast, from the Bosumtwi Crater in Ghana. Numerous other tektite to impactite sites are found, usually associated with smaller craters. Moldavites are Central European tektites. 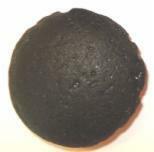 They are amongst the most valuable of tektites due to their green colour, which makes them ideal for use in jewellery. 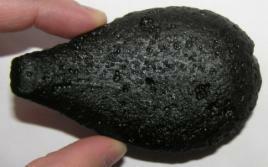 ​Are tektites a kind of meteorite? No, tektites are formed by large meteorites or asteroids/comets impacting the Earth, but they are principally composed of melted terrestrial (Earth) rock. Traces of the extraterrestrial component may be found by detailed isotopic analyses. Meteorites come from space, tektites come from the Earth. ​Do they come from the moon? Historically, many papers have been written suggesting a lunar origin. Following the Apollo lunar landings and analyses of the lunar rock brought back to Earth, a lunar origin can be ruled out for all known tektites. Furthermore, the distribution of the morphologies indicates a terrestrial origin. Geochemical analyses also link Moldavites with the Ries Crater, Ivory Coast tektites with the Bosumtwi Crater and North American tektites with the Chesapeake Crater. The lunar origin theory is often pushed by dealers in tektites as it enhances their value. The vast majority of scientists accept a terrestrial impact theory. Whilst the moon is not well suited to the production of tektites, due to the lack of silica, some tektite-like glass may be produced on the Moon and land on the Moon as Lunar 'tektites'. 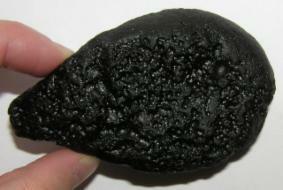 Tektites can also be produced on Mars and these land on Mars as Martian tektites. Lunar and martian tektites have never been recorded to travel to the Earth, although theoretically it is possible that a very small percentage of tektites produced by impacts on other planets may reach Earth, as meteorites from Mars and the Moon have reached Earth. ​How much are they worth? On average, tektites are not that valuable. Tektites, particularly from Indochina, are very common and have limited value. Value increases in the west: tektites can be bought much cheaper at the source. Moldavites, with a beautiful green colour, are considered as gemstones and the value is therefore enhanced. Very rare shapes such as complete Australite buttons fetch high values. Similarly exceptional and unusual specimens , in terms of perfection, sculpture and size, will fetch higher values. Like with art work, you cannot set a price on a unique piece. Tektites, like all other commodities, work on a supply and demand basis. Moldavite value has increased as mining has essentially stopped. Some tektites in Asia, that are actually pretty common at the source, may fetch high values as nobody is supplying/selling them. In the west someone may pay hundreds of dollars for a stone. At the source they may be thrown around as they are so common. As online payment methods improve in Asia, more sellers may emerge in Asia as the value of the tektites is recognised. I hope these sellers also recognise that they need to provide locality details to maximise their profit. ​Which side is the front and which is the back? In small Australites the anterior shows flow ridges leading up to a flange in well preserved specimens. In small to larger specimens the anterior of cores is the side where material has 'flaked' away from the specimen, due to thermal shock. The smooth rounded surface is the original posterior surface. In Philippinites, Billitonites and Bediasites the side with U-grooves (or the most U-grooves) is the anterior, the smooth side is the posterior. In Indochinites (and Georgiaites, Moldavites and Ivory Coast tektites), i.e. proximal forms, the side showing bald spots around the margins, representing flaked material due to thermal shock, is the anterior. The side with the most pitting is also usually the anterior. In all tektites U-grooves characterise the anterior and V-grooves or Anda sculpture characterises, or is best developed, on the posterior (unmodified) surface. ABOVE: Hardest to differentiate until you get your eye in - The Indochinites. This teardrop specimen is from China. The left photo has the anterior surface at the base (note the bald spot). The Middle Photo is the smooth unaltered posterior. The right photo is the anterior, showing many etch pits and a bald spot around the rim where glass has flaked away, due to thermal shock during re-entry. Note the similarities with australites, where the margins of the anterior flake away. Also, in these teardrop specimens the shape is a give-away - the 'tail' points up on the posterior. ABOVE: Philippinites. On the left a side view, with the grooved anterior surface facing down. The grooves are chemically enhanced thermal cracks. In the middle is the smooth unaltered posterior. To the right is the grooved anterior. Billitonites and Malaysianites basically have the same morphology as Philippinites, as do bediasites. ABOVE: Easiest of the lot. An Australite core in side profile and a button australite in side profile. In both cases the anterior surface is the bottom of the photo. The core has lost it's shell due to thermal shock during re-entry, whereas the button has simply ablated. 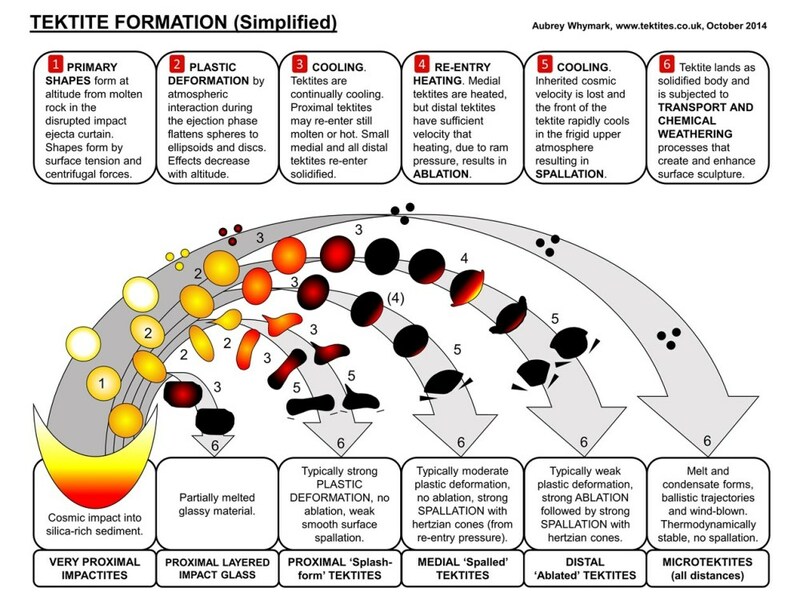 Buttons are never found over around 6 grams, as over that size they are thermodynamically unstable and will always 'flake' to form a core during re-entry heating. Look at the posterior surface of the button - this shows the original spherical shape of the body prior to re-entry.